After years as a youth softball player, Meghan played Varsity softball in high school and has stayed close to the game playing and coaching ever since. 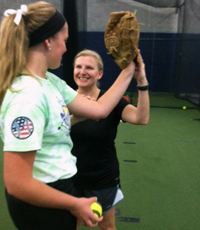 She is an ACE Certified Youth Coach and has a true passion for helping girls and women learn how to use not just their body but their mind to be the best pitcher they can be. Her belief is that pitching should feel natural and authentic. Once a coach starts manipulating a body’s natural course, injuries increase and performance eventually suffers. Pitching should NEVER hurt. In fact, Meghan believes pitching is only 10% physical and 90% mental. After several years of seeing young arms ruined by forcing girls and women into a “one size fits all” method of pitching, Meghan decided to look for alternative and new developments to pitching … which brought her to Fluid Dynamics. After meeting Denny and learning about his approach to pitching, Meghan knew she’d never go back to traditional pitching. I chose to use Fluid Dynamics as my coaching guide because it was the only style that made sense to me. After being coached in a similar way during my youth, I understood the value of using the style a pitcher’s body choses and working within it, not trying to change it. Our bodies know how to work best for themselves so the fact that Fluid Dynamics incorporates not just how you pitch, but why you pitch the way you do into every exercise and drill really spoke to me. I also truly believe that without complete parent support and involvement an athlete is an island without anyone to guide them in the healthiest way possible. Fluid Dynamics uses parents to watch, teach and guide their children to be the greatest pitcher they can be in the best way possible for their own body. Denny’s excitement and enthusiasm is what inspires me daily to continue to help pitchers and coaches find a better way of improving and developing. I am committed to Fluid Dynamics, Denny and their approach. Nothing comes close to the results I’ve seen so far and I look forward to seeing more girls and women succeed as pitchers due to Fluid Dynamics. Here is what Denny says about Meghan: From our first conversation I knew Meghan would be a fabulous instructor. She had done her research, constantly challenged me to help her understand new and better ways to get results, and is motivated by seeing kids achieve their dreams. Even at the end of a very long day in training, Meghan continues to enthusiastically ask questions and make sure she understands every detail. She is going to continue to grow and grow as an instructor.